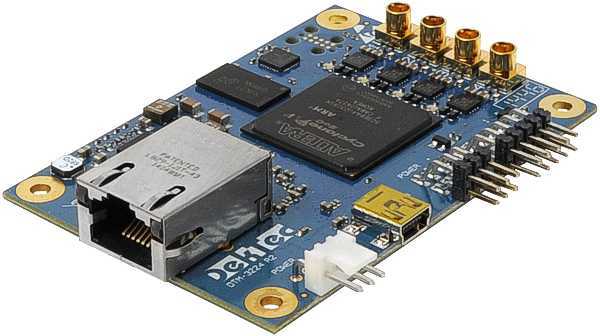 The DTM-3224 is a highly-integrated and cost-effective OEM module for converting four ASI transport streams to IP. The next-generation architecture of this device has support for IPv6 and for IGMP v3, enabling source-specific multicast. Quad ASI to IP conversion module. Development kit, consisting of DTM-3224, power supply, USB cable and four MCX-to-BNC cable assemblies for ASI port. The DTM-3224 can be controlled through one of the available serial interfaces. Settings applied are stored in nonvolatile memory on the unit, and automatically reloaded after a power cycle. It is not possible to configure the device via the Ethernet interface. Dtm3224Util - Windows tool to view status, to control settings and to upload firmware. This tool is convenient for initial configuration and for experimentation with the DTM-3224. DtmHandler - A set of C functions, also useable from C++, implementing a protocol handler. With these functions, controlling the DTM-3224 from your application becomes really easy. Full source code is available, so that you can use the protocol handler functions with any compiler. DtmCmd - Windows/Linux command line tool for controlling the DTM-3224. DtmCmd is an example of using the DtmHandler functions. The root of the DTM-32XX product line. The DTM-3200 is a generic product for ASI-to-IP and IP-to-ASI conversion (but not at the same time), while the DTM-3224 is dedicated to ASI to IP conversion for high density (4 channels) and cost effectiveness. The DTM-3224 uses an all-new architecture with support for IPv6 and IGMP v3 (source-specific multicast). A boxed product for single-channel ASI to IP conversion, mountable on a DIN rail or in a 19" inch rack. The DTM-3224 uses a serial control connection, while the DTE-3120 has a web GUI and SNMP agent. An important difference is that the DTM-3224 supports IPv6 (DTE-3120: IPv4 only) and IGMP v3 (DTE-3120: no SSM).